I know this might sound crazy to some people, but I love to exercise. No, really, I do. I mean, I don’t always want to exercise, but much like I don’t always feel like washing dishes or cleaning the bathroom, they are things that need to be done. Not only do I exercise for my overall health and fitness, but especially for my mental health and well-being, which is why I especially love running. The problem is that I can’t run every day. Well I could run every day, but it wouldn’t be smart because I’d probably end up with an injury and also because I realize that being truly fit requires balance and variety. My biggest challenge is finding workouts that offer variety, but also keep me interested so I don’t get bored. I also tend to like workouts that are short and sweet, but pack a good punch. Let’s face it, if you’re only going to exercise for fifteen minutes it needs to be a challenging fifteen minutes that works your muscles and leaves you reaching for a towel to wipe off a little sweat, which is why I love Better Rocker’s FREE 30-Day Challenge! You basically just enter your name and email address and then wait for each daily workout to arrive. Not only does the email include a video so you can do the workout with Betty, but she also explains each exercise in the body of the email for reference if you need it. I’ll be perfectly honest, though, and say that I wasn’t sure how I felt about her personality and style initially, which is probably more about me than her because I’m really picky when it comes to following along to a video workout at home. I made a commitment to the 30-day challenge, though, so I stuck with her and I’m really glad I made that decision. Here’s the thing. Whether you’re like me and looking for a workout to add a little variety and challenge to your existing fitness routine or you’re someone who is just getting started this is a great plan to add to your rotation. One of the things I like most about it, especially for someone who needs a little boost to help them get started with exercising, is that the workouts are literally only around 15 minutes per day. We can all find 15 minutes a day to exercise, right? In case you need a little more convincing here are a few reasons why I love Betty Rocker’s plan and why I think you might, too. Like I already mentioned the workouts are short and sweet. Fifteen minutes (for the most part) that will challenge you without leaving you feeling discouraged and then you can carry on with your day feeling motivated and energized. One of the most important things that Better Rocker recognizes is that everyone is at a different fitness level, which is why I love that she offers several modifications for each workout. Listen to your body and do what you can and eventually you’ll get stronger and be doing things you might have never thought possible. It might seem cheesy, but I found her to be genuinely encouraging, which I think can be pretty tough to achieve through a computer screen. Betty’s sincerity came through for me and even though she wasn’t physically in the room with me, she motivated me to push myself and work hard during every workout. She’s engaging on social media and by that I mean she replied pretty quickly to a couple of my tweets, which speaks volumes about how important it is to her to actually connect with her fans and followers. While many of the workouts were super challenging, there were several easier days to balance them out. For example, after the first few days of workouts I was feeling kind of ready for a little break and it’s like she heard me because the next email was for a yoga routine. Don’t get me wrong, yoga is a good workout on its own, but in a different and sort of relaxing kind of way. The daily workout video expires. Okay, before you freak out and think that’s a bad thing, think of it as a way to challenge yourself and hold yourself accountable. Even though the entire routine was explained in the body of each email, I made it a priority to follow along with the video every day. It definitely takes a little self-discipline since you only have yourself to answer to, but I promise it’s totally worth it because you’re worth it. Results. Obviously we all want to see and feel results, especially if we commit to a 30-day plan and while I don’t have before and after photos to share, I can definitely tell you I see a difference in my body. More importantly than the physical changes I visually see is the fact I felt stronger as the challenge wore on. Toward the end I was doing many of the moves without some of the modifications I was using early on. To me, that’s the biggest sign of a successful challenge, even more so than the number on the scale. P.S. If you need someone to cheer you on your hold you accountable every day, I’m here for you, but either way I hope you’ll give this challenge a shot because what have you got to lose except maybe a few unwanted pounds. Sounds like something that would be easy to incorporate into my current fitness plan as an added bonus since it is so short. Oh boy, we totally think alike, Mandy. I love having variety and this is perfect for that. I like that the workouts change up every day and that they’re just 15 minutes. I could totally fit that into my day! That is exactly what attracted me to this challenge, Liz, because I knew I could set myself up to succeed rather than give up after a few days if all I add to commit to was 15 minutes per day. I hope you’ll check it out! this sounds fun. I am always up for a new challenge for sure. It IS fun, Rebecca, and totally worth the daily 15 minutes. My problem with workouts is that I get discouraged too quickly. I could probably handle a workout like this and be aliright with it. Oh my gosh, I’m the same way, Dawn. One of my favorite things that I forget to mention is that Betty suggests creating a blank calendar with 30 days and literally crossing off each one after you do the workout. Something about that helped to keep me focused, especially since it was hanging on a wall where I could see it as a reminder every day. 15 minutes sounds perfect to me. I need to get better about exercising consistently. Me too, Helene, especially for those who feel overwhelmed with the thought of needing a long, hard workout to be successful. This one is challenging, but also fun and leaves me feeling motivated for the rest of the day. Love this and so need to try it. I’m always making excuses! Yes, Brianne, you do need to give it a try. I promise it will be some of the best 15 minutes you’ll ever spend. I signed up for this and loved here! I didn’t finish the challenge because I hurt my back. (Not doing the workout) I do want to start again, I felt great and she’s just too fun! Oh my goodness, Milena, sorry to hear about your back, but I definitely hope you can give it another try. I really loved Betty, her spirit, and her workouts. I think I could have written every word of this review. 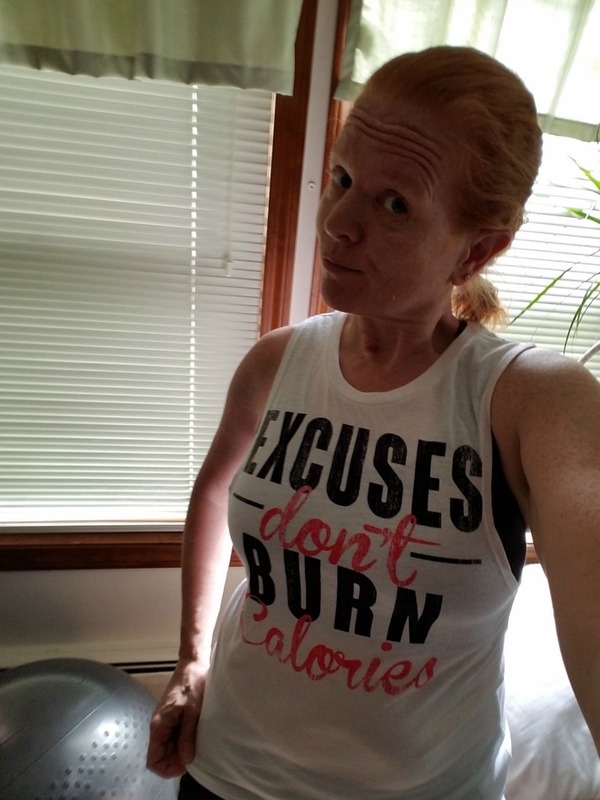 I agree completely, even with your reasons for why you exercise! Would you recommend this for someone who is in the worst shape they have ever been in? (Yes, I’m talking about me ?). I’ve always been in decent shape until the last couple of years. Now I am over weight & over 40 y/o. I want to get in shape without hurting myself! I say go for it, Joanie, because like I mentioned in my post Betty does a wonderful job of offering several different modification options regardless of your fitness level. I have also done 2 rounds of Betty Rocker’s challenge. I not only felt stronger but saw major changes. I took before and after pictures. I was leaner, lost inches off my waist, etc but I also dropped about 30 pounds. I admit my diet was very clean and strict (6 meals a day, water consumption only). Yes, I found it easy to commit 15 minutes a day to myself first thing in the morning so at least I knew I got my exercise out of the way for any given day during those 30 days! So happy you too enjoyed success with Betty Rocker. Do you know if u can get the workouts on appleTV? I love her workouts so much, I just completed day 19 of the 30 day challenge and I’m feeling amazing. I looked down at my legs during a downward dog the other day, and I didn’t even recognize them! lol. Like you there were moves I couldn’t do at the start, ie the burpee. But I tried one the other day and I could do it! I’m definitely contemplating doing the 90 day challenge as this is the only fitness program that I have stuck to consistently in years. people; thee points usually takes a tu?n for w?rse. To increase the cleaning power from th? water, cleaners iin many cas?s are introduced in to the water stream. as hea?ty as discount high-end hot tubs.